Welcome to the Radio Demo Center. Join us at our second location just down the street from Radio Boardshop. The demo center is located on the walking mall on 400 East Cooper Ave. in downtown Aspen. We have both ski and snowboard rental/demo available as well as the best tuning around from our new wintersteiger machine. The Demo center features a wide selection of some of our most popular sought after snowboards available so you can try before you buy! Brands include Burton, Lib tech, Gentemstick, Ride snowboards, Rossignol, Armada, and nordica. -New this year we also have Burton's Step On available for demo and the largest stock for purchase in North America. 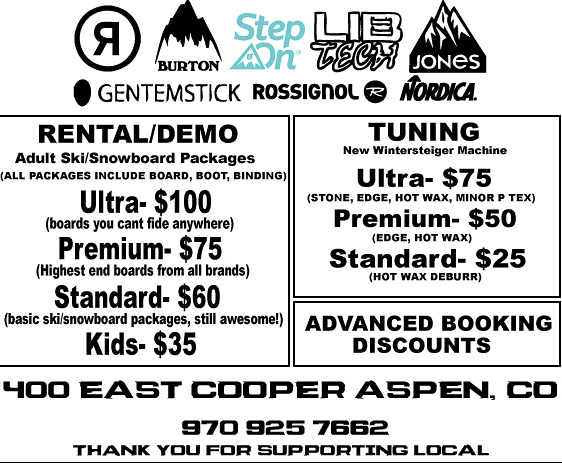 SPLITBOARD DEMO- $100 per day, Jones and Burton splitboards, spark R&D bindings, Skins, Poles.